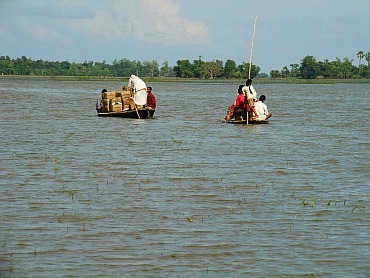 The flood situation in Bihar remained grim on Thursday, contrary to the State government's officials claim that situation was improving. M I Khan reports. Nearly 15 lakh people have been affected by the floods, and thousands have been forced to flee their homes and take shelter on highrise embankments, national highways, railway lines and in schools and other buildings, officials said. The situation worsened in Sitamarhi, Madhubanim, Muzaffarpur and Darbhanga districts in northern Bihar with Bagmatim, Adhwara and Lakhandei creating havoc inundating hundreds of villages in last 24 hours. The Adhwara River breached its embankment at four places in Sitamarhi on Thursday morning , affecting thousands, an official said. "Rising levels of Bagmati and Adhwara group of rivers is posing a serious threat to lives as the flood waters entered hundreds of villages," an official in the State Water resources department said. Road and rail communications were disrupted because of the rising water levels. The worst-hit was Sitamarhi district. Some ruling party members of Legislative Assembly including Vinod Narain Jha demanded state government to provide adequate relief to people and evacuate the stranded. 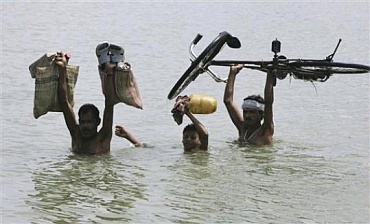 "Till date at least 31 people have died of drowning at different places in the state, and more than 9,000 houses have been damaged ,mostly in Madhubani and Sitamarhi " Vayasji ,principal secretary of the department said. According to Central Water Commission officials, the water level of river Ganges is receding and Sone, Kosi, Gandak,Bagmati rivers are also on the decline. 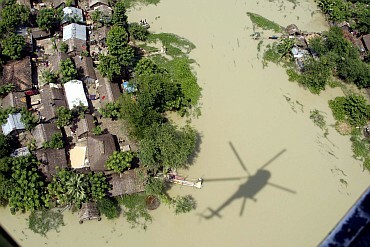 Bihar Chief Minister Nitish Kumar along with officials on Wednesday carried out an aerial survey of the affected areas to take stock of the flood situation. After the survey, Kumar directed officials to speed up rescue and relief operations in the flood affected areas. The chief minister also asked the state health department officials to arrange for medicines and DDT sprays to check outbreak of diseases once the flood water subsided.